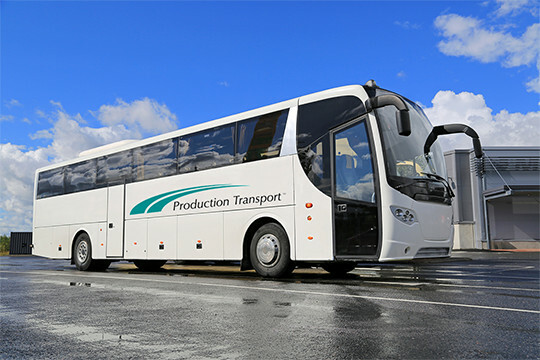 At Production Transportation, we are proudly offer high quality shuttle services for large groups. If you have a large group that is traveling to and from the airport for a convention, trade show or another event, we can plan your transportation. Our buses will depart the convention center at pre-scheduled times so that your group can know when to arrive at the determined destination. If you want your group to travel in style and comfort, our shuttle bus service is the best solution. We are pleased to provide the finest airport shuttle bus service for your ultimate convenience. Our shuttle buses are comfortable and convenient. We will get the right bus for the amount of people you need, whether that be a mini bus or deluxe motor coach. Traveling to and from the airport can be such a hassle. Don’t let your company have a bad experience with finding their own transportation. Your group will enjoy the convenience of our airport shuttle service and feel happy and secure. Our transportation company was founded in 1982 with the aspirations to serve people across the nation with unparalleled ground transportation. We are proud to have continued this important legacy for over 34 years. We offer the finest shuttle bus service and outstanding customer service. Our top priority is providing our customers with the most convenient, reliable and positive transportation experience. Ready for a convenient and positive transportation experience?